Until now! Go grab up some of these at your local store and start working on some of these wooden crate ideas we found ASAP! And if worse comes to worse, we’ll tell you a little secret. They also sell them at Michaels (pretty good deal with a 40% coupon 😉 ) and other craft stores. What a great idea for bathroom storage! 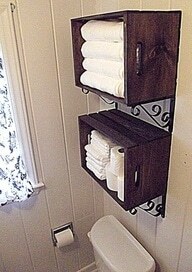 This was found at home-2-me.com and is such a wonderful way to store the towels in small bathrooms. This one was prettied up with some hardware that can be picked up at any home improvement store and hung from the wall. Wow! Now this is quite a nightstand to use in a bedroom! This was found via Pinterest and we have to say…genius! This will make it easy to clean, since you can vacuum under this nightstand without a problem! Paint or stain it anyway you want to match your bedroom and you have a great piece of furniture. 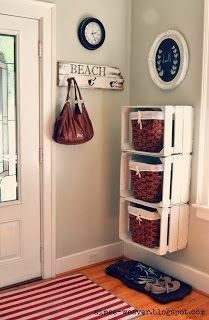 Looking for something frugal to store all of those items that constantly clutter up your entryway? Look no further than this DIY Wooden Crate Storage Idea we found on Pinterest! Paint them to meet your needs, and hang them on the walls by stacking them for your storage needs. Throw in some baskets to keep things tidy and you have yourself a great solution for minimal cost! Need something eye-popping and fun for the little ones to store their stuffed animals and books in? 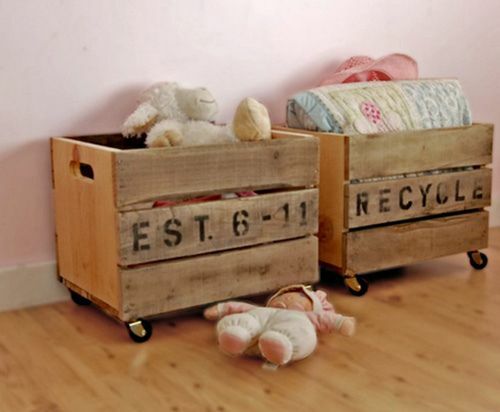 Check out this Stacked Wooden Crate Toy Storage idea we found on Pinterest! 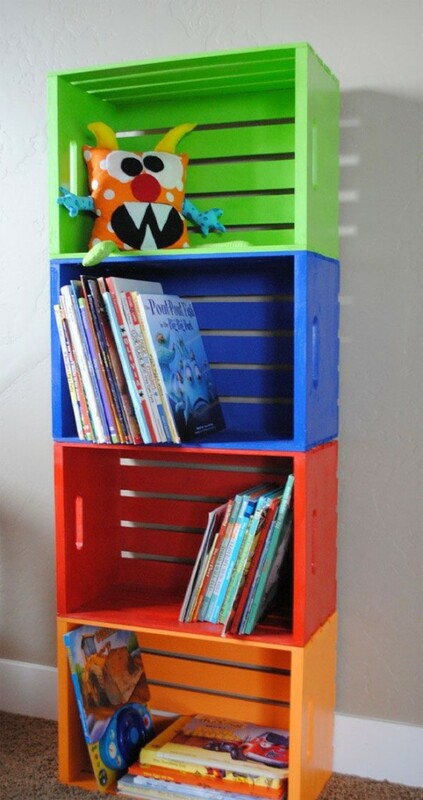 Paint them in fun and bright colors, stack them up, and voila! You’re done! The kiddos will love this and you’ll love having something fun and frugal to keep the house in order. Now this is a fun organizational project that doubles as an outstanding display. We found this on Pinterest and it requires a little more work, but wow! What an awesome idea! 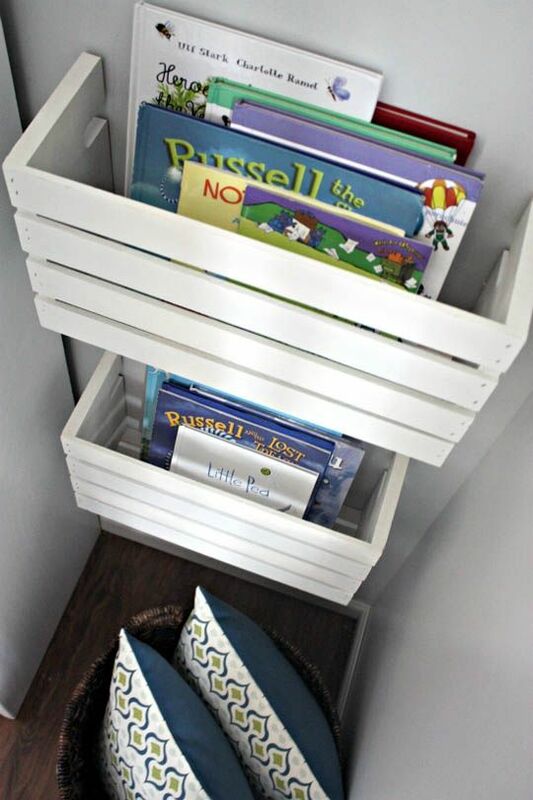 Cut wooden crates in half and attach them to the wall and you will suddenly have a great display area for children’s books that also keeps them off of the floor! Grab up some wheels at your local home improvement store, attach the wheels to some crates, and you suddenly have an awesome toy storage box that can be moved easily from area to area around your house. We love this Pinterest find! Now this may look pretty fancy, but this is a wonderfully unique DIY project! You can do this! 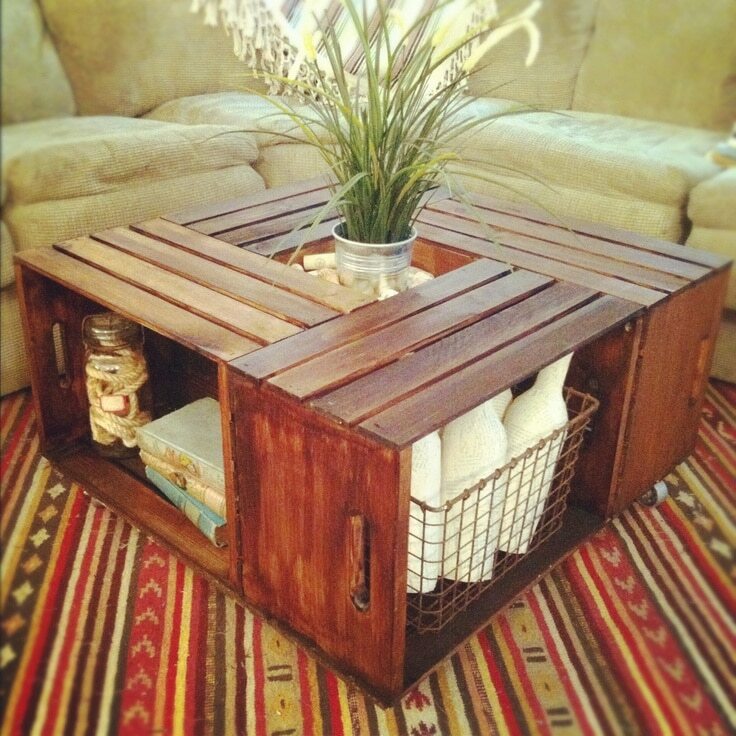 We found this on Pinterest and this Wooden Crate Coffee Table can be crafted anyway you want! Grab 4 wooden crates, nail them together, and bam! You have yourself a coffee table! Stain or paint however you want beforehand and you’ll have something custom crafted for your own home. And you have to love that storage you’ll gain in the open parts of the wooden crates! 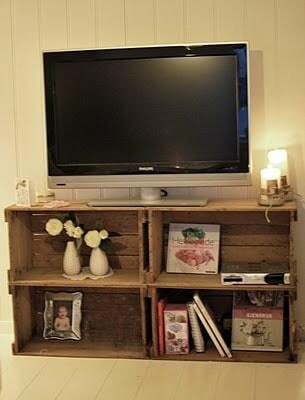 Similar to the idea above, make yourself your own Wooden Crate TV Stand! While we found this on an International website, the concept seems pretty universal here! 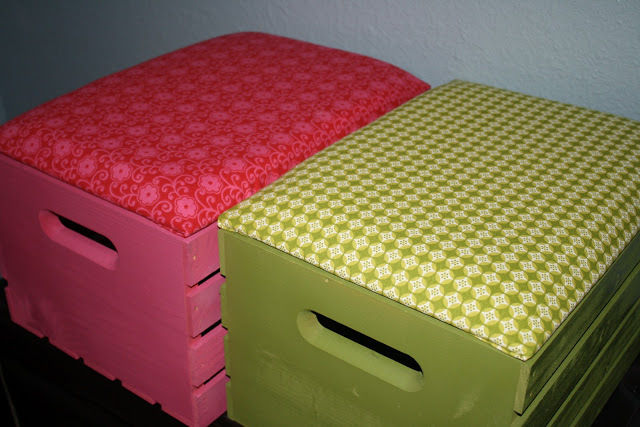 Put your DIY skills to the test with these great Wooden Crate Ottomans/Extra Seats! Found at thebiggestmuch.com, they take you through a step-by-step process on how to create these beauties! Customize them to your liking and you have a wonderful seat! 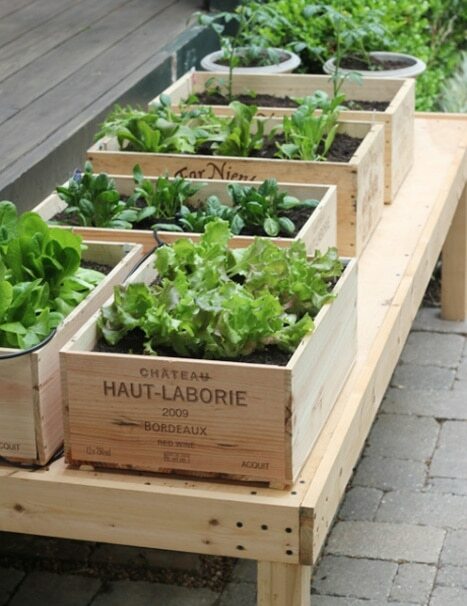 One of the gardening ideas actually was found on Pinterest and used Wooden Crates for Gardening! Easy, frugal, and smart. This is the perfect solution for those items you love to grow that seem to take over your herb garden. Give them their own space! 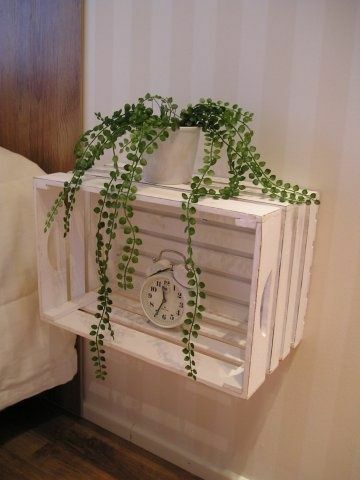 These were only a few wonderful and fun ideas you can use wooden crates for around your home. So start scoping out your local stores or check out the deals you can get from Michaels. Lord knows we all can use a little less “clutter” in our lives and these ideas are awesome to help you out with that!